A trip through the Negev Desert leads to the heart of Israel's national nightmare. From the podium of the UN General Assembly, Israeli Prime Minister Benjamin Netanyahu seamlessly blended frightening details of Iranian evildoing with images of defenseless Jews “bludgeoned” and “left for dead” by anti-Semites in nineteenth-century Europe. Aimed at US and Iranian moves towards diplomacy and a war-weary American public, Netanyahu’s gloomy tirade threatened to cast him as a desperate, diminished figure. Though it was poorly received in the United States, alienating even a few of his stalwart pro-Israel allies, his jeremiad served a greater purpose, deflecting attention from his country’s policies towards the group he scarcely mentioned: the Palestinians. 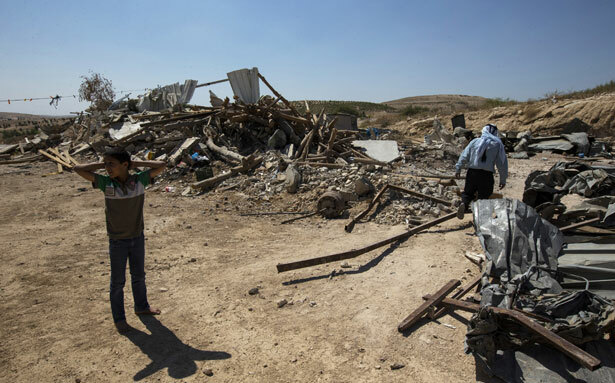 On September 9, I visited Umm al-Hiran, a village that the state of Israel plans to wipe off the map. Located in the northern Negev Desert, well behind the Green Line (the 1949 armistice lines that are considered the starting point for any Israeli-Palestinian negotiations) and inside the part of Israel that will be legitimized under a US-brokered two-state solution, the residents of Umm al-Hiran are mobilizing to resist their forced removal. As darkness came to the desert, I set out with my colleagues into the piney woods of Yattir. In a small car, we wound along its unlit roads until we reached a gate bristling with barbed wire. This was the settlement-style village of Hiran—“the Jews in the woods,” as al-Ahmed had put it. We called out into the night until the gate was opened. Then we parked in the middle of a compound of trailer homes. Like a shtetl in the Pale of Settlement, the hard-bitten Imperial Russian territory once reserved for Jewish residency, the place exuded a sense of suspicion and siege. “Us over here, them over there” was the slogan of Barak’s campaign for reelection in 1999, and of the Peace Now camp supporting a two-state solution at the time. Through the fulfillment of the Labor Party’s separationist policies, the Palestinians of Gaza and the West Bank have gradually disappeared from Israel’s prosperous coastal center, consolidating cities like Tel Aviv as meccas of European cosmopolitanism—“a villa in the jungle,” as Barak said.